Over the years that I've been reading about video games on the Internet, I hear constant praise (and also some hate) of older consoles and the games that were on them. My first console was the PS2 slim, and my first handheld the GBA SP. Everything before that I've never played, despite knowing lots about the SEGA vs Nintendo console war, the Video Game Crash of 1983 and people telling me "what do you mean you've never played the original Super Mario Bros?!" So, I've always wanted to be able to play all of the games and consoles that were before my time that I hear about. So when I found out that my grandparents have an Atari 2600 I instantly plugged it in to an old CRT TV, plugged in a cartridge and... well, this is what I thought. First of all, can I just say that plugging in a cartridge is the most satisfying thing. That click when you push down is so much better than watching a PS3 slowly eat your disc. The wood finish is also really neat. It looks nothing like any other consoles and it's the kind of thing that if I had in my own house I'd gladly put on a shelf. I have six games which you can see in the picture below. Thankfully no ET. I have plans to cover each of these games separately, so look for that in the future if I ever get to doing it. I have to say, I do miss having big colourful instruction booklets. They're filled with guff but there's something charming about them that I miss with new games. Reading the fake stories and the such of the game you're playing is funny to me, coming from a day where you can read up everything about a game before you buy it. Really, the same goes for the box art. I mean, look at that guy's face. Look at it. He's so serious about Super Breakout. No messing around, it's serious business. There was an initial problem with the system though; some of the games were US. My TV and console were PAL. Basically, this means that some games display in the wrong colour. Thankfully it doesn't affect gameplay, and it took me a few minutes to realise that you had to restart the system for some games to stop flickering. After I crossed this hurdle, I started up the system. I'm incredibly split on my opinion about the system. On one hand, it's awesome to be playing old games. Much like if you owned an old book. On the other hand, these games (and the system) haven't aged very well at all. Spoilt by games of now, when I play a game I look for a nice art style, intuitive and fun gameplay, fair difficulty, an in-depth story and great music. I'll start by saying that the games I played were fun and intuitive to play. With either the paddle or joystick, you had one directional... object and a button. It's very easy to work out what to do for the games I played and they were fun for quick entertainment. But that was really it. No immersive worlds, no art style (due to graphical limitations) and what killed it for me; no music. Now, maybe I'm just stating the painfully obvious but very few of the games on the Atari 2600 have deep gameplay. Obviously this was due to technical limitations and the home console adaption from arcade cabinets, but I can't help but want a game that can be played for hours on end. That doesn't mean I dislike the system. For its legacy alone it makes me hold it in much higher regard than I would if it had released in recent years. It really is a great system and I see why so many people praise it. I just can't think of it in the same way I think of the games we have now. It's like comparing Castlevania to Journey. Castlevania has a lot of great things going for it, but in my opinion it just can't compare to a game like Journey, made in a time where it can take bold steps where games just couldn't before. 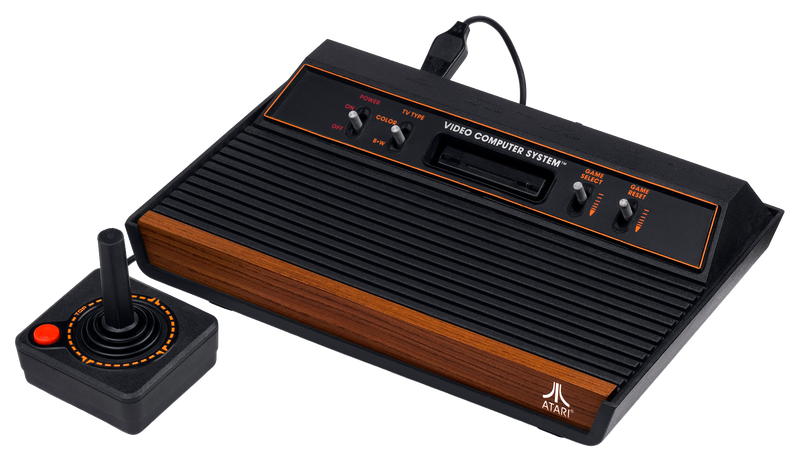 What was your first console? And if you've ever played a console from before your time, what was it and what did you think of it?